Who will install your solar system? 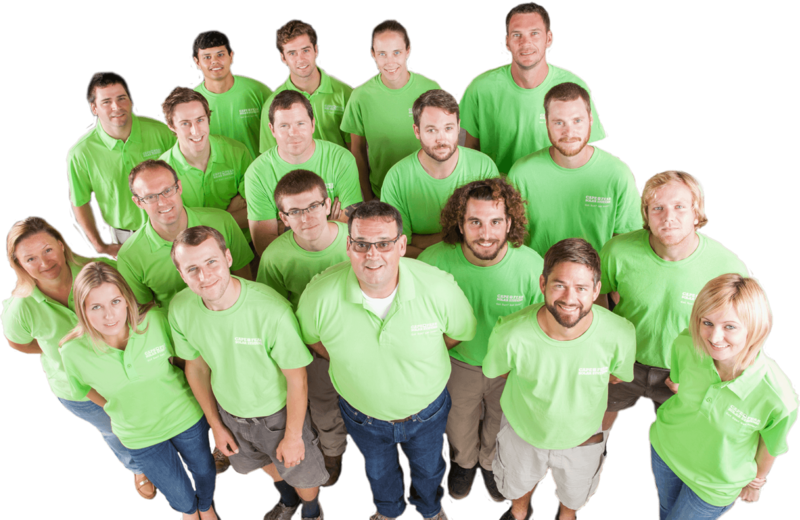 Meet the Cape Fear Solar Team! 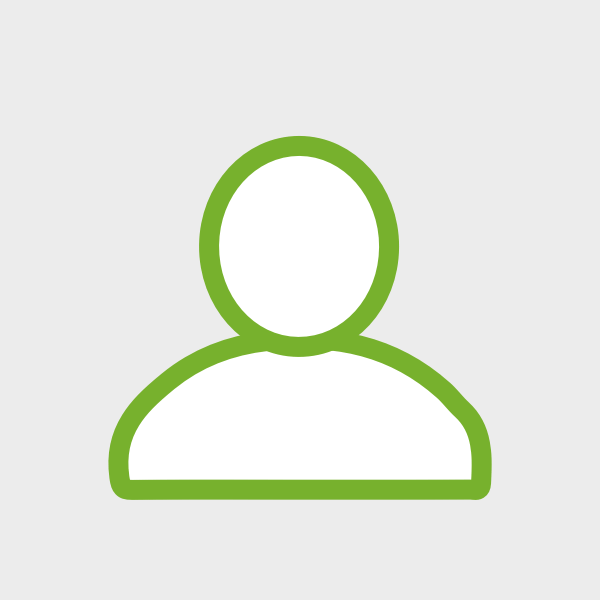 We have a team of exceptional individuals ready to serve you to meet your energy needs. We all care for our customers and believe that solar power is the future of a safe, stable and modern nation. We all are on a mission to maximize the use of the renewable energy in our sunny region. Right now, we strive our best to bring solar one house at the time. Growing up in Wilmington and spending a lot of time on the water with his family, it was at a young age that John had begun to realize the awesome power of the sun. 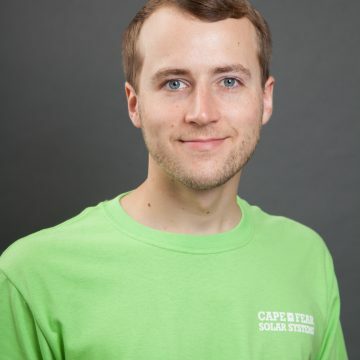 It was John’s long term passion for alternative energy that led to the creation of Cape Fear Solar Systems. Prior to establishing Cape Fear Solar John worked overseas in the aerospace industry, leading international business development activities for one of the main industry players. John holds a degree in Mechanical Engineering from Villanova University, and MBA from the University of Bridgeport. Throughout his professional training and education, he has obtained multiple certifications related to the design and the installation of the renewable energy systems and is a NC Licensed General Contractor. A childhood on the pristine Carolina coast instilled in him a deep respect for the natural world and a sense of responsibility for its well-being. 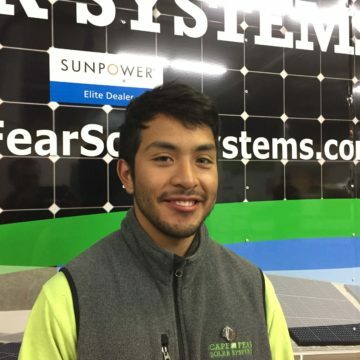 After graduating from the University of North Carolina at Chapel Hill with degrees in Economics and Environmental Studies he is excited to be working in the rapidly growing solar energy industry. Robert is passionate about helping to bring a clean and secure energy future to the Wilmington area and happy to assist customers with any questions throughout the completion of their solar project. Robert is NABCEP® PV Certified Solar Installer (#PV-041616-013206). Emily grew up in Poland and moved to the United States in the early 2000s. She graduated from Saint Joseph’s College in Patchogue, NY with a bachelor degree in accounting. Her strong understanding of taxes, billing and internal record keeping was enhanced with experience from numerous tax offices in the New York City area. Being a mother to four children, she is dedicated to raising her kids with a great understanding and appreciation of the environmental issues effecting the Earth. After spending nearly a decade vacationing in Wilmington, Cassandra is now proud to call North Carolina home—after relocating in 2014 from Chicago, Illinois. As a seasoned Brand and Marketing Manager, Cassandra enjoys the fast-paced, ever-changing atmosphere of the advertising world and has led creative and marketing efforts for many respected brands. Cassandra’s great sense of community connected her with the Azalea Festival, where she serves as Co-Chair of the Boxing Committee. 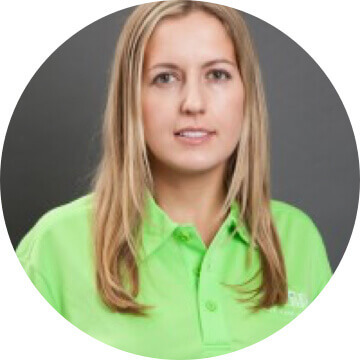 When she is not performing marketing activities or illuminating the value of solar energy, Cassandra can be found with her family at the beach, walking her dog, or boxing. Cassandra is a registered USA Boxing athlete, official, and coach. Forrest grew up in Colorado spending a lot of time in the mountains where the enjoyment of the natural world and its inherent beauty imparted a sense of obligation to protect the environment for future generations. He obtained a degree in Business and Entrepreneurship from Baylor University in Texas, and moved to Wilmington with a zeal for promoting environmentally-conscious and renewable energy sources. He is passionate about showing customers the myriad of reasons that investing in solar energy is a path to a better world. Catch him around Wilmington camping, surfing, kayaking, or hiking with his wife and dog, and talk with him to see how you could benefit by taking advantage of the free energy from the sun! While growing up on a barrier island off the coast of North Carolina, Charles gained an immense appreciation for the environment and his natural surroundings. His desire to remain by the coast led him to attend UNCW, where he graduated with a bachelors degree in International Studies. 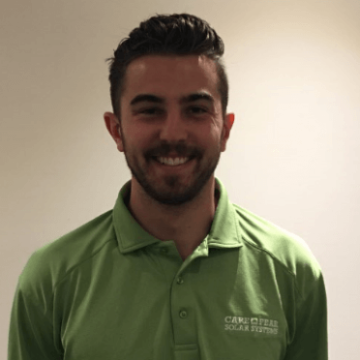 After graduating Charles began working with CFSS where he is currently fulfilling his desire to eliminate nonrenewable resources and develop a stable environment for future generations. His former work experience has instilled in him a sense of professionalism and a dedicated work ethic that he looks forward to sharing with his customers. In his spare time Charles enjoys being on, around, or in the ocean. His favorite hobbies include spearfishing, surfing, fishing and also cooking! His new favorite hobby, however, is educating others about the endless benefits and possibilities of going solar! Growing up in Wilmington Zach has always had a strong passion for nature and helping humanity become more sustainable with its energy systems. 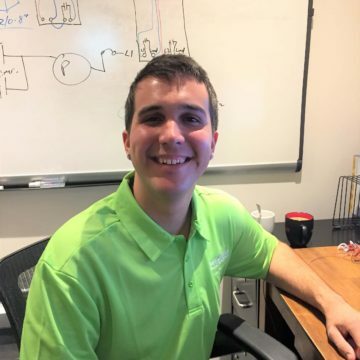 Zach has experience in many areas of sustainability such as algae biodiesel, wind energy, and energy modeling. After going through the Cape Fear Community College Sustainability program, he became passionate about all forms of renewable energy and architectural design. He focused his time on learning programs like Sketchup and AutoCAD for personal projects which became key skillsets of his career. 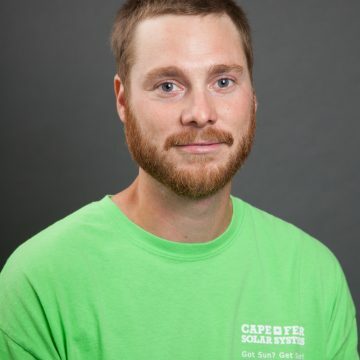 After working in construction and customer service jobs, Zach began working for Cape fear solar systems as a design associate. Originally from New York, Jason greatly appreciates the warm and sunny weather brought to him in North Carolina. Jason is passionate about renewable technologies and computer systems. 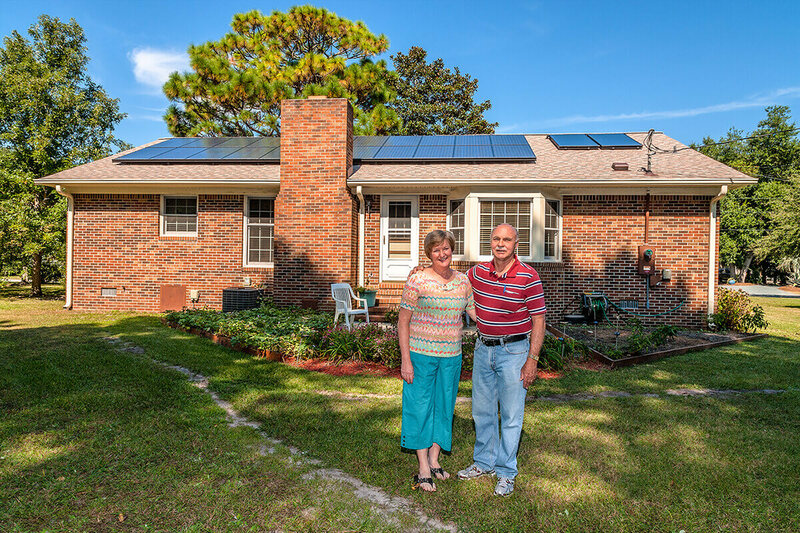 He now gets to put his skills to use daily—helping Cape Fear Solar customers with the latest solar technologies. Jason holds a general education degree from Cape Fear Community College. He is OSHA certified in safety construction and hopes to become NABCEP® Photovoltaic certified in the future. When he is not helping solar customers Jason enjoys spending time with his family, going to the beach, and building computer systems. Gabe grew up in Manchester, Maryland before moving to Fuquay Varina, North Carolina in 2006. He is currently a senior at the University of North Carolina at Wilmington where he is majoring in Business Administration with a concentration in Marketing strategy, and minoring in Spanish. He is eager to help others see the benefits of renewable solar energy while contributing to a hardworking and passionate team. 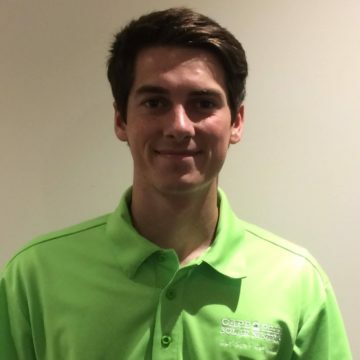 As our marketing intern he is excited to learn from our experienced marketing staff. Gabe loves to play sports and referees soccer during his weekends so don’t be surprise if you see him taking in the sun at the local park! A native of New Hanover County, Glenn spent most of his career in Wilmington as a Consulting Engineer. 25 of those years as the principal engineer of his own engineering firm. 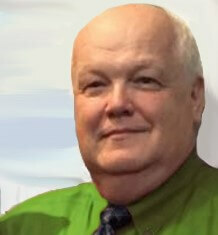 Glenn earned a bachelor’s degree in engineering from NC State and is a licensed professional engineer. In the past he served as charter member and president of the Southeast NC Chapter of the American Society of Mechanical Engineers (ASME), Assistant District Governor of the Rotary Club District 7730, and President of the Wilmington East Rotary Club. Throughout his career, Glenn has been a member of several professional engineering organizations including, Professional Engineers of North Carolina, National Society of Professional Engineers, American Institute of Building Designers, and a number of technical organizations. As a licensed and experienced engineer, Glenn has been a wonderful addition to the Cape Fear Solar System Family. Kyle brings with him an 13-year background in construction. Most of that past experience is in the plumbing field, serving a customer base spanning from high-end shore communities to modest suburban apartment complexes. Kyle has learned to take care of others’ space and things as if they were his own with a sharp eye for tidiness during and after a top quality project has been completed. Rapidly developing and clean, renewable energy is an exciting thing to be a part of for Kyle. Installing solar was something new to him as a career idea but quickly took root and became like something he had worked on in the past. Kyle is OSHA certified in construction safety and has successfully passed both, the NABCEP® Photovoltaic and NABCEP® Solar Heating Entry Level Exams. Recently, Kyle achieved a NABCEP® PV Installation Professional Certification (#PV-042217-015127). Daniel was born and raised in Charlotte. After graduating high school he moved to Wilmington and completed the Electrical Systems Technology program and graduated from Cape Fear Community College. 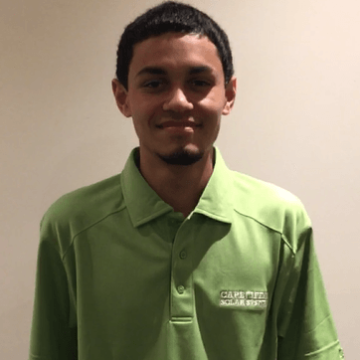 Daniel hopes to soon take his NABCEP Exam for the PV Entry Level Certification and eventually wants to obtain an electrical license. He likes being able to please customers by providing top notch service and answering questions about the solar industry. Daniel has always loved outdoor activities and really enjoys skateboarding, basketball, and playing disc golf. Growing up in Charlotte made him an avid fan of both the Carolina Panthers and Charlotte Hornets. Chris moved to NC after serving our country in the US Navy for over 20 years. Enjoying the gifts that nature has to offer in our state’s beautiful and diverse outdoor life, he realized that promoting and installing clean, reliable energy would be a great way to give back to the environment. A service that would be appreciated for generations to come. With a background in mechanical engineering and backed with strong OSHA Safety training, a career in solar energy seemed the logical next step. 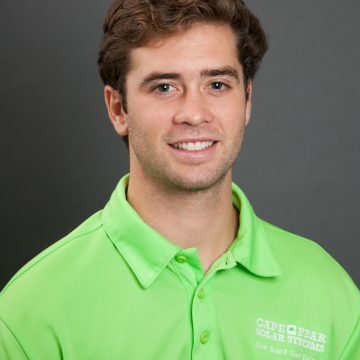 Chris has passed the NABCEP® Photovoltaic Entry Level Exam and is always looking to step up and learn the trade to the best of his ability to provide sound solar solutions to our customers. James moved to Wilmington from Pennsylvania in 2017. James firmly believes that renewable energy is essential for a sustainable future. 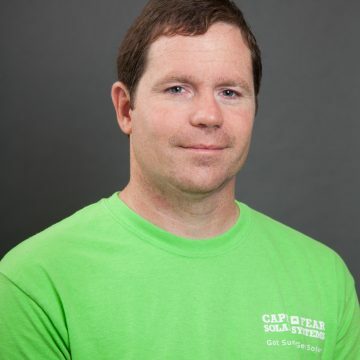 His passion for solar energy and enjoyment of working outdoors brought him to Cape Fear Solar Systems. James is OSHA certified in safety construction and is working towards his NABCEP® Photovoltaic certification. When he is not installing solar arrays for our customers, you can find him near Wrightsville Beach riding his bike, running, surfing, and fishing. 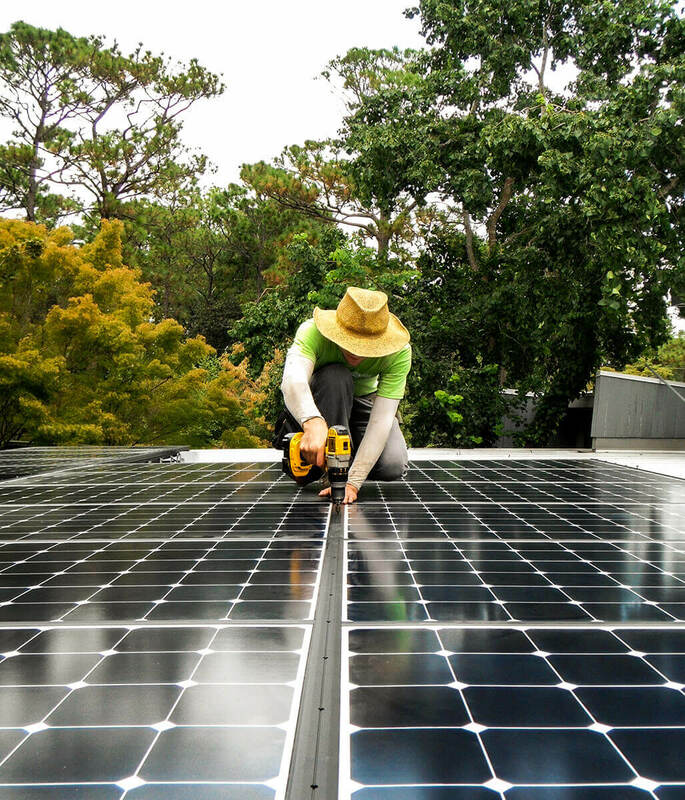 Nestor and his family moved to NC when he was a child and he tries to do everything he can to care for our environment while being fascinated with solar energy. Nestor is OSHA certified in safety construction and plans to become NABCEP® Certified. 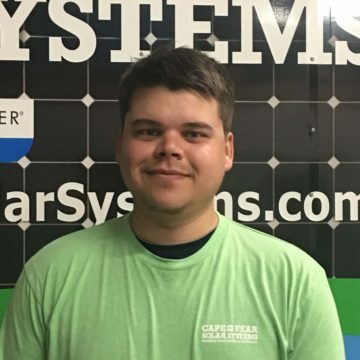 He also plans to continue growing his knowledge in solar energy by taking advantage of ongoing training opportunities provided to him as a Cape Fear Solar employee. When he is not installing solar arrays, Nestor can be found spending time outdoors, boxing and caring for his dog. He is a registered USA Elite boxer who has competed on a state and national level. Colbie is a wonderful addition to our growing team! Bio coming soon. Nakiya is a wonderful addition to our growing team! Bio coming soon. 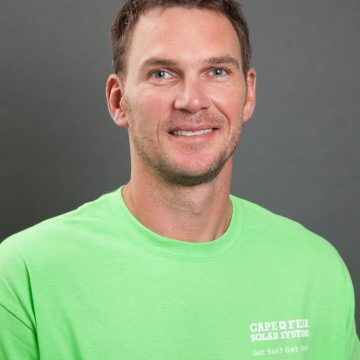 As a NC Licensed Electrician, Wesley brings 16 years of experience spanning all aspects of electrical construction and service, including residential, commercial and industrial. It is this vast experience, combined with extensive training and hands on knowledge of photovoltaic systems, that assures Cape Fear Solar consistently meets or exceeds the high standards of quality that have been designed into each one of our solar installations. Given his unlimited supply of energy and enthusiasm, Wesley identifies with the inexhaustible nature of solar power and eagerly awaits the day when solar modules are as common on roof surfaces as ordinary asphalt shingles are today. 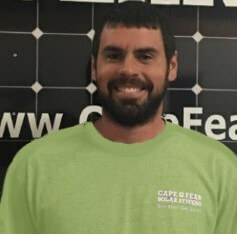 Darell supports Cape Fear Solar’s installation crew with over 30 years of experience in residential and commercial plumbing. He has been providing high quality design and installation of plumbing systems ranging from custom built homes, additions and remodels to light and medium commercial buildings. His area of experience includes not only plumbing of solar thermal systems, but extensive work with PVC, cast iron, copper, pex, cpvc, silver soldering, fusion acid waste piping, black iron gas piping and galvanized piping. 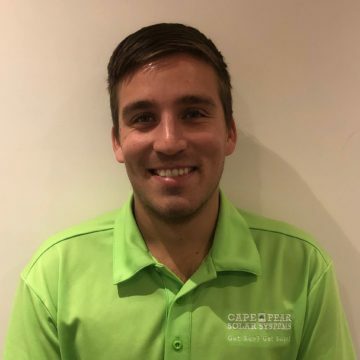 Darell has worked on some high profile homes and buildings in our area and enriches Cape Fear Solar Systems’ installations with his professionalism, customer dedication as well as the high quality and reliability of his work. 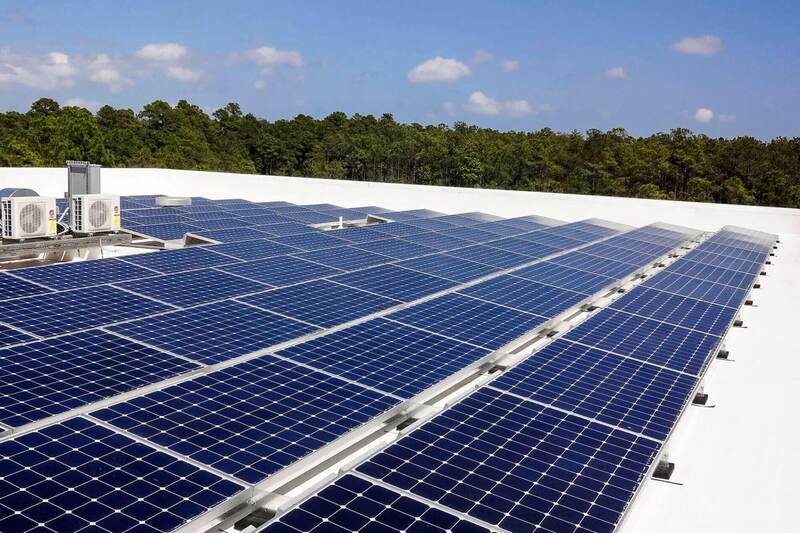 Cape Fear Solar Systems is the go to company for homeowners and businesses wanting solar in the Greater Wilmington region. We strive to not only meet, but exceed our customers’ expectations and we seek independent individuals with attention to detail to enlarge our team. We work very closely with our customers to design a solar system that meets their goals in energy savings. We would never install solar on unsuitable locations. We provide accurate numbers and install systems of the highest quality. Over 280 customers are proof of our craftsmanship and professional dedication. If you are a self-starter enjoying a challenging environment, where results speak louder than words, we may be the right fit for each other. A technical mind and passion for renewable energy are a must. Having prior experience in the solar industry is a huge plus. NABCEP® Certification or having passed the NABCEP® Entry Exam is an even bigger plus! Do you enjoy interacting with people? Do you have a passion for renewable energy and sustainable living? Do you pride yourself on your commitment to your customers’ success? Are you successful in a busy, often changing environment? Do you respond well to challenges? Are you creative? If you are a sales star, you can earn well in excess of $100K. Will train someone who has everything we want. You must be awesome at opening doors and getting appointments from a cold start. You must be highly self-motivated, a terrific presenter and communicator, and a barracuda closer. Come build an empire within our fine, progressive company. We have a superb reputation and need real stars to bring in the best customers. This is a great opportunity for a rewarding career in the solar industry for an independent individual that seeks a professional growth. Cape Fear Solar Systems has opening for a full-time solar installer with experience in general construction and/or having passed the NABCEP® Entry Level Exam. Job consists of solar installation efforts from the ground and on the roof, preparing material and tools for various stages of installations, generating precise measurements, and completing first class solar water heating and photovoltaic systems installations for residential and commercial customers that demonstrate the quality and craftsmanship for which we are known. The job requires the ability to repeatedly lift large and heavy objects, often while climbing ladder/s. The job requires lifting and carrying safely a minimum of 50 lbs. without assistance, and to push and pull up to 150 lbs. with appropriate equipment. Some of the frequently required physical demands may include bending, kneeling, and reaching, standing for long periods of time, climbing ladders, and handling and assembling small, medium and large parts. If this sounds interesting to you, send resume and a short description of what you would bring to this relationship. Let’s see if we are a good match!